Our executive director and organization have been featured in the latest edition of Current! Read the whole story by clicking here! In times like these, honoring the principles of integrity, respect, and due process is critical. When the US Senate signs off on the lifetime appointment of a Supreme Court Justice, the nation deserves assurance that all “T’s” are crossed and “I’s” dotted. In what has become an all too common occurrence, there have been continual attempts to assassinate the character of both the accuser and the accused. It is excruciating to watch yet another woman be publicly vilified for speaking out. Threats are being hurled at both individuals. All the while, publicly elected officials are contributing to the chaos by ignoring the need for an impartial investigation to determine facts. The Senate Judiciary Committee’s process for crucial background investigation should be followed now as new information continues to emerge. Because there are no second chances with a lifetime appointment, the Committee and the Senate must get this right. Women4Change believes that a full investigation of the allegations should be undertaken in order to secure the integrity of the judicial appointment process. Sign our voter pledge and signature causes forms! Are you ready to say, "Count me IN!"? Sign our voter pledge and commit to showing up at the polls (or vote early!) and cast your ballot in the upcoming midterm election on November 6th. Click here to sign the online form! We are also very interested in knowing which of our signature causes are of highest concern for you and your family. Make sure you fill out our signature causes form and tell us what issues you are most passionate about. In an effort to inspire new hope and revitalized civic participation, Women4Change Indiana is relaunching our book discussion series! We are currently in search of discussion leaders eager for the opportunity to be part of something meaningful and facilitate the kind of small, living room discussions essential to the improvement of our democracy. If you feel passionate about civil literacy or feel obligated to engage in conversations that promote change, please consider becoming a discussion leader. We believe that this initiative can fundamentally change how we view our government, our politics, and our democracy - and we hope you will be an essential part of that effort. Please make reservations for the training session that works best for your schedule by sending an email to alysa@women4changeindiana.org. If you have questions that aren't addressed here, please call Terri Bowman at (317) 938-4482 or Tricia Stash at (317) 523-1541. Buy Your Women4Change Indiana T-Shirt Today! 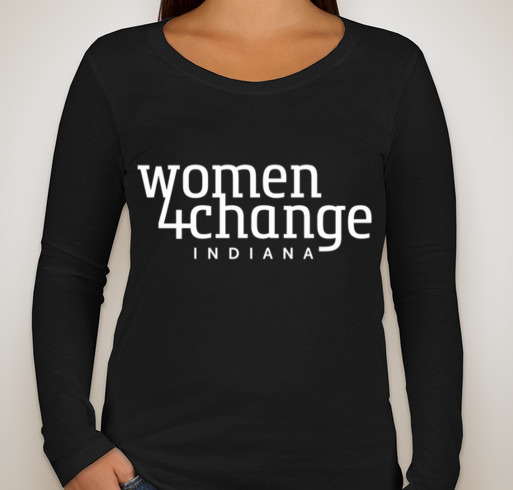 We have Women4Change Indiana t-shirts ready to buy online for $29. Click here to shop our t-shirts and support our organization through your purchase! Multiple colors and sizes are available. Indianapolis—On June 18, 2018, the U.S. Supreme Court declined to rule on the merits of the Gill v. Whitford and Benisek v. Lamone cases that challenged the constitutionality of Wisconsin’s and Maryland’s redistricting plans. This decision allows both states’ current maps to stand for the time being. Women4Change Indiana (W4CI) continues to support the creation of an independent redistricting commission in Indiana to end the practice of partisan gerrymandering which prevents fair representation of voters’ interests. All Hoosiers should care about redistricting. Districts that fairly represent voters’ interests give all Hoosiers equal opportunity to express the priorities of their families and communities. An independent redistricting process will empower voter voices and reduce the impact of political party agendas. Gerrymandering creates barriers to competitive races for office, leading to the retention of incumbents and generating voter apathy. W4CI and its partners will continue their work to bring about redistricting reform because having fair voting districts is vital to democracy in Indiana and the entire United States. Founded in 2017, Women4Change Indiana is a nonpartisan, grassroots, collaborative organization whose mission is to equip and mobilize women to engage effectively in political and civic affairs. Members work to strengthen democracy and to advocate for the leadership, health, safety, and dignity of all women in Indiana. How does gerrymandering impact Indiana? In the 2016 election, Indiana was ranked the 14th worst voter turnout amongst the 50 states and the District of Columbia. 36 out of the 100 races for state representative are uncontested for 2018. 6 out of the 25 races for state senate are uncontested for 2018. In Indiana, “Republicans generally win 53 to 57% of the votes in state legislative races, but have drawn the maps with such surgical precision that they now find themselves in 71 to 80 of seats in Indiana House and Senate, respectively.” (Krull, Feb. 4, 2016). In the 2018 Indiana House of Representatives election, 9 out of the 14 candidates running in the Indianapolis metro area are unopposed Democratic candidates (Ballotpedia, 2018). Republican candidates won 7 seats in the US Congress. Democrats won 2. If the percentages of votes for statewide Republican candidates (President, US Senate and Governor) had been reflected in the elections for US Congressional seats, the results would have given 5 seats to Republicans and 4 to Democrat candidates. 25 seats were up for election in the Indiana Senate. 11 (44%) were basically uncompetitive and 16 were held by incumbents, all of whom were reelected. Republican candidates won 19 seats and Democrats won 6. If statewide pluralities had been reflected in these races, the Democrats would have at least doubled their seats from 6 to 12. All 100 seats in the Indiana House of Representatives were up for election. Of these, 26 were not contested—26% of the total. 4 additional seats had essentially uncompetitive opposition, receiving from 13%-19% of the vote. Thus, 30 (30%) of the House seats were essentially uncompetitive. The final composition of the Indiana House was 70 Republicans and 30 Democrats. If statewide pluralities had been reflected in the final results, Republicans would currently hold 51-57 seats and Democrats would hold 49-43 seats. “Research by University of Sydney professor Simon Jackman, likewise, suggests that legislative maps in under a dozen states could be susceptible to challenge for extreme partisan bias.” (Brennan Center for Justice, 2018). Indiana is one of the few states with high Republican partisan bias, as seen by the following image. ‪No child, no parent, no teacher, no person should ever have to experience this horror. We stand with the victims of the Noblesville West Middle School shooting and will not accept these tragedies as commonplace. This must change. Click here for coverage from the IndyStar. "Ohio voters approved a gerrymandering reform proposal Tuesday that would change how the state draws congressional district lines following the next US Census."